There are often times during the year when the school is complemented by current or former pupils or members of the public who have met the children of Old Oak in some capacity. Rather than keep these to ourselves we are going to share these with you. 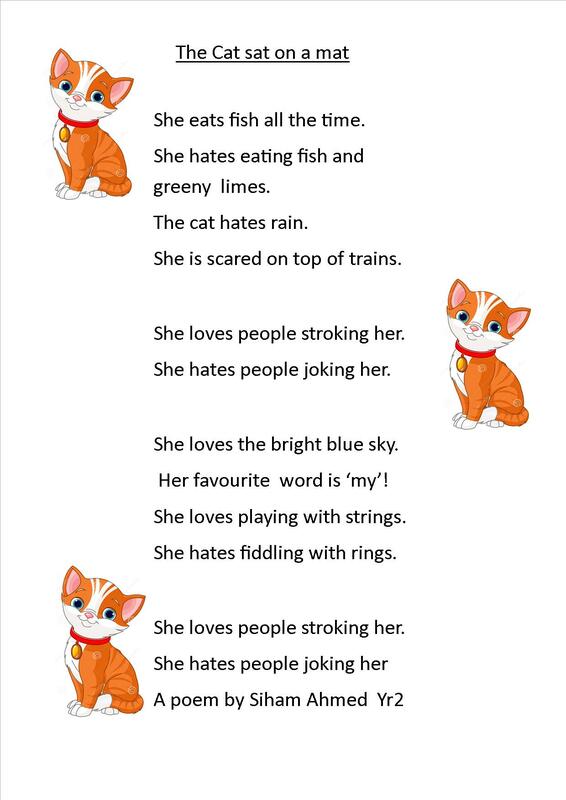 Some of the children at Old Oak Primary School attended a writing club and have produced some lovely poems. See below. Last term, the School Council carried out a school-wide Teaching and Learning questionnaire. The members of the School Council wrote the questions and then the teachers gathered the responses of the pupils in their class. The questions related to their opinion of the teaching in the school, ranging from how interesting they find lessons to how effectively they felt their teachers delivered lessons. This term, the School Council will be carrying out a Behaviour and Communication questionnaire. The results will be published later in the term. As a family we want to pass our gratitude for the impact you have had in the life and development of our children. We are so thankful to have been part of the Old Oak Primary family. We have seen our children grow and become who they are today. All of this would not have been possible withour the contribution of all of you. The kids will definitely miss the school and all it represented to them. Goodbye! Hope to see you visit our country and God bless you all! I have been visiting Old Oak Primary School with the Lifebus for many years now. I always look forward to visiting your school. The children are a pleasure to teach. They are bright, full of enthusiasm and keen to share their knowledge and ideas. They show higher order thinking skills and are very emotionally intelligent. I know that some of your children have come to this country from very traumatic situations and in your school, they are made to feel welcome, they settle and thrive. This is largely due to the nurturing and caring atmosphere you and your staff ensure in school. All the children know how to care for each other. Their behaviour is exemplary, they are polite and respectful. They learn well and I am always amazed by how much they remember from year to year. I always enjoy teaching at Old Oak – it is more fun than hard work. Many thanks to you, your hard working staff and all the children who make the visit so worthwhile and memorable. I hope you all have a very good academic year. This is just a short note to say thank you for inviting me to visit Old Oak Primary School yesterday. I thoroughly enjoyed our tour of the school, and it was obvious both through observing the stimulating and nurturing environment, and all of the positive interactions between students both with each other and with the faculty, that Old Oak really does an incredible job of creating an outstanding learning environment for all of its' students. In addition to being (from my own observations) an exceptional oasis of love, learning and happiness for those fortunate enough to attend it, it seems to me that Old Oak also stands as a symbol for all that is good, in terms of representing the positive outcomes that are achievable through peoples' combined positive intentions toward creating the best possible future both for young people and the local community, especially when contrasted starkly against the walled background of Wormwood Scrubs. To be honest I was both impacted and inspired by my visit yesterday, and really appreciated the opportunity to visit many of the classrooms, talk to the students, and spend time with the Head, Joseph Brown and Deputy Head, Katie Brown. Katie was particularly helpful in sharing many details about the school and I appreciated how generous both she and Joseph Brown were with their time with me - especially when I can only guess how busy their days are. I would be happy for you to share my thoughts about my visit to Old Oak with other members of the faculty and the Board of Governors if you would like to. You all should be congratulated on all you have accomplished as a team! Many thanks again, for what was for me, a truely inspirational visit. I’d just like to start this by saying thank you, Old Oak, for everything you’ve given me. I still remember my wonderful years at the school, the memories I have there from my childhood years are truly unforgettable. The school created an environment that really helped me develop most of my social skills and of course the basis on which all my current knowledge is built upon, it was certainly key in making me the man I am today. I attended Old Oak from my early nursery years till I left at the beginning of year 6 in 2006. I’ve been daydreaming about my days there all day and so I searched for the school website and looked at the current staff and, I must admit, many of these names are completely new to me. There is one name, however, which I do recognize very well, and that is Ms. Emma Morley. I remember her specifically as she taught me during my last year; she was also in charge of a Macbeth play I was part of, which I remember till this day was quite extraordinary. Today, I am a fourth year medical student at a top university back in my home country of Saudi Arabia. Of course, I would not be here today without the stellar education I received at Old Oak. You see, we often forget people we knew back when we were kids, but people like Ms. Morley and many others, people who have had such a great impact, people like her are very difficult to forget. 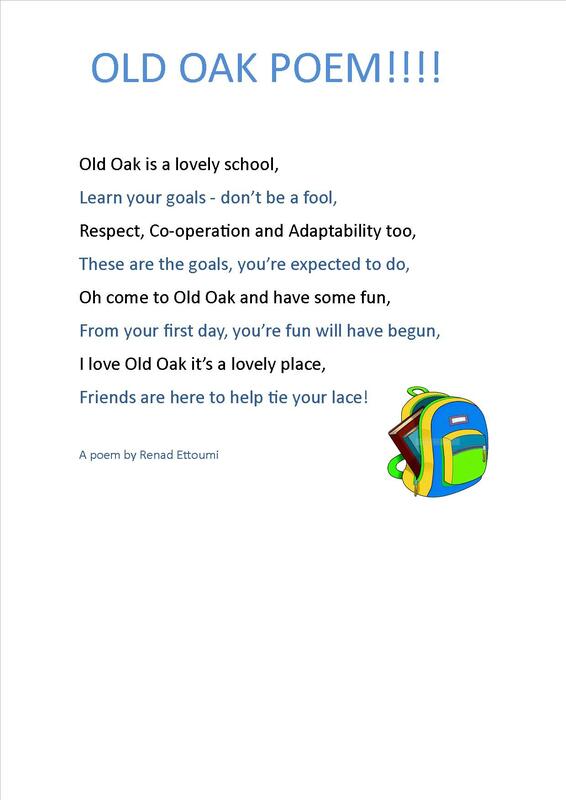 So thank you, Old Oak, and thank you Ms. Emma Morley. You have not been forgotten. To observe the school trip to Imperial for Graduation this morning, as your pupils and very able staff made their way through Notting Hill Tube station. The effort that the staff made to ensure the group caused minimal disruption and the behaviour of the children was a delight to see. I trust the Graduation initiative will bear fruit in the future. The mutual respect between staff and pupils was very evident. The chance meeting made a great start to my day. Many thanks for your email. It has made a great end to our school term. The staff here work very hard to support children's personal development alongside the core curriculum and for you to notice this outside of school is lovely to hear. I will pass on your message to the teachers and children alike and hope you are lucky enough to meet other children from Old Oak in the future. They are a fantastic bunch. You are, of course, very welcome to come in at any time. We encourage visitors who can provide the children with positive role models. Thanks for your prompt reply. You have a school to be very proud of. We recieved a lovely letter from from a family this October 2016. You can read it below.